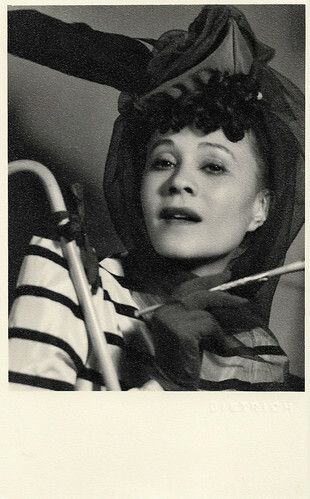 Gusti Huber (1914-1993) was an Austrian stage and film actress. 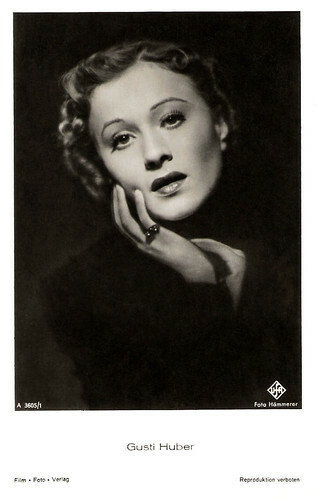 She was a popular actress in the cinema of Nazi-Germany. In 1946 she moved with her American husband to the US and continued her career on Broadway. She played Anne Frank's mother in the Pulitzer Prize winning play The Diary of Anne Frank and later also in the film version. German postcard by Ross-Verlag, no. A 3605/1, 1941-1944. Photo: Ufa / Hämmerer. German postcard by Ross-Verlag, no. A 2235/1, 1939-1940. Photo: Bavaria Filmkunst. Auguste ‘Gusti’ Huber was born in Wiener Neustadt, Austria in 1914. She studied at the Academy for Music and Representative Art in Vienna. 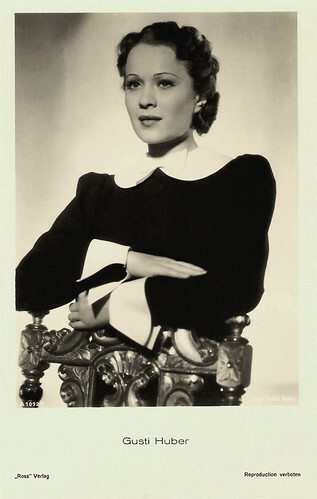 During her studies she began her acting career in 1929 at the Deutsches Volkstheater. She joined the Schauspielhaus in Zurich, where she played more than 180 roles in a five-year period. 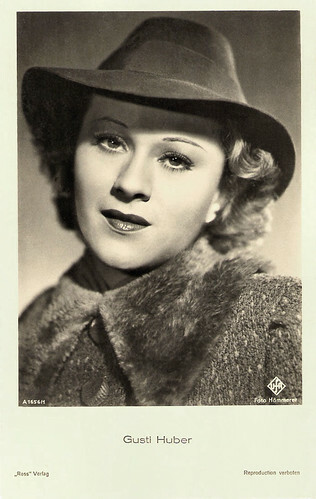 In 1935, she had her first film role in the Austrian drama Tanzmusik/Dance Music (Johann Alexander Hübler-Kahla, 1935), starring Liane Haid. Her debut was followed by the German drama Savoy-Hotel 217 (Gustav Ucicky, 1936) with Hans Albers and Brigitte Horney. One year later she achieved her career breakthrough in the film adaptation of Unentschuldigte Stunde/The Unexcused Hour (E.W. Emo, 1937) as the daughter of Hans Moser and Dagny Servaes. That year she also appeared opposite Albert Matterstock in the romance Land der Liebe/Land of Love (Reinhold Schünzel, 1937). Although Schünzel was Jewish he had been allowed to continue directing films in Germany after the Nazi takeover. However, this film faced objections from the censors and from Joseph Goebbels. It was briefly shown and then disappeared from cinemas. It was Schünzel's final German film as director, and he went into exile shortly afterwards. Among Huber’s better-known films were also Kleiner Mann - ganz gross!/Little man - very big! (Robert A. Stemmle, 1938) with Viktor de Kowa, the comedy Marguerite : 3 (Theo Lingen, 1939), and Herz - modern möbliert/Heart - modernly furnished (Theo Lingen, 1940). 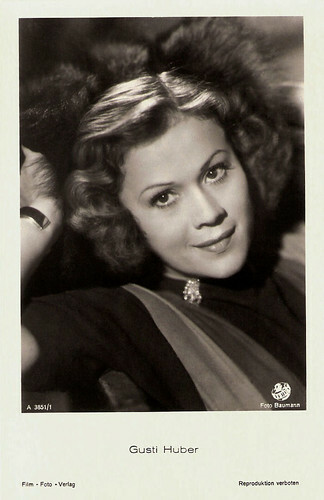 During the war, she starred in a few films including Jenny und der Herr im Frack/Jenny as Detective (Paul Martin, 1941) with Johannes Heesters, and Gabriele Dambrone (Hans Steinhoff, 1943) with Siegfried Breuer. During this period she worked mostly at the famous Burgtheater in Vienna. German postcard by Ross Verlag, no. A 1092/1, 1937-1938. Photo: Witt / Tobis / Rota. German postcard by Ross Verlag, no. A 1656/1, 1938-1939. Photo: Ufa / Hämmerer. German postcard by Ross-Verlag, no. A 2880/1, 1939-1940. Photo: Tobis. After the liberation of Austria in World War II, Gusti Huber joined a company entertaining American troops. She met and married Joseph Besch, a United States Army captain and former newspaperman. Around 1946, the couple moved to the United States. Besch boasted that his wife was "the first Austrian actress to be cleared by the American military government". She acted only occasionally thereafter. 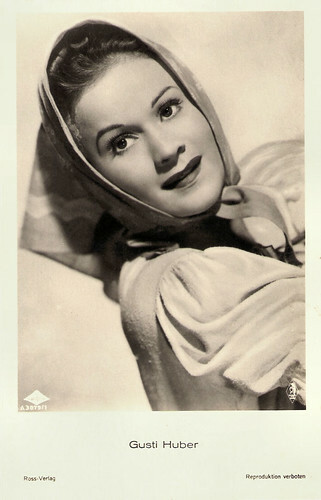 In 1952, she made her American debut on Broadway in Flight Into Egypt, the story of an Austrian refugee family struggling to get to America, directed by Elia Kazan. On TV she appeared in episodes of such series as Suspense (1952) and The Further Adventures of Ellery Queen (1959). Most notably were her roles on Broadway such as Margot Wendice in Dial M for Murder, and Anne Frank's mother, Edith in the Pulitzer Prize winning play The Diary of Anne Frank, adapted by Frances Goodrich and Albert Hackett. Her last film was The Diary of Anne Frank (George Stevens, 1959), in which she reprised her Broadway role. This caused controversy in some circles as Huber was rumoured to have been too close to the National Socialists, but Garson Kanin who had staged the Broadway play reportedly stood by the casting. The Diary of Anne Frank won three Academy Awards in 1960. After retiring from acting in 1961, Huber lectured in New York area high schools on the legacy of Anne Frank, the Jewish girl who hid from the Nazis in a garret in Amsterdam and who died in a concentration camp shortly before the end of World War II. 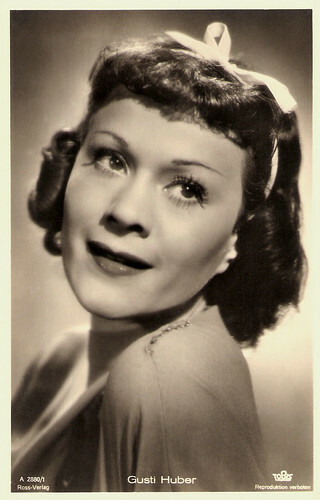 In 1993, Gusti Huber passed away at her home in Mount Kisco, N.Y. The cause was heart failure. She was 78. Huber was married twice. Her first husband was Gotfrid Köchert, an Austrian racing driver, who served in the Wehrmacht during World War II. They had two children, Bibiana Maria (1942-1996), who, known as Bibi Besch, was a successful actress during the 1970s and 1980s, and Christiana Barbara (1939-2004). Her second husband, Joseph Besch, adopted Huber's daughters, who took his surname. Besch and Huber had two more children, Drea and Andrew. Actress Samantha Mathis, Bibi's daughter, is one of Gusti Huber’s grandchildren. German postcard by Ross-Verlag, no. A 3075/1, 1941-1944. Photo: Wien-Film / Bavaria Film-Kunst. 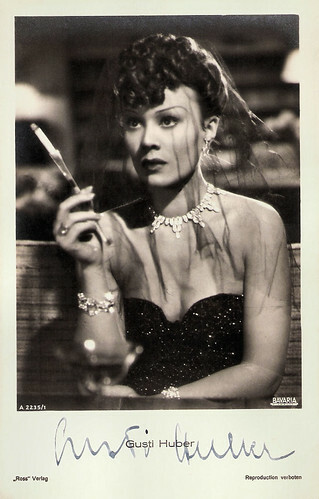 Publicity still for So gefällst Du mir/I like you that way (Hans Thimig, 1941). German postcard by Film-Foto-Verlag, no. A 3851/1, 1941-1944. Photo: Baumann / Terra. German postcard, no. 68252. Photo: Dietrich. Publicity still for the play Ich liebe vier Frauen/I love four women. Sources: Ellen Feldman (American Heritage), Marvine Howe (The New York Times), Thomas Staedeli (Cyranos), Wikipedia and IMDb.